pipe cleaners and googly eyes. : Colors And The Kids. With the sounds of lingering fire crackers echoing through the streets of Bodh Gaya, I can’t help but feel incredibly lucky and grateful to be celebrating Diwali with Nikesh and boys, while volunteering at the Ao Zora School. Today was truly an awesome day. Because of Diwali, the students are on holiday until Friday. 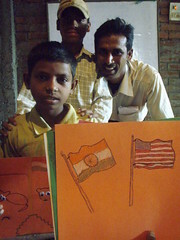 The orphans living at the school are all boys, ranging from ages 5-14. 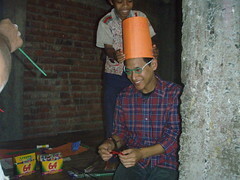 When I arrived this morning, I was asked if I could teach an arts and crafts class with the supplies I brought. Those kids are incredible… they’re all so talented at drawing and came up with the most creative ways to use the googly eyes! Oh, and bringing pipe cleaners was such a good move, they love them! After the morning of coloring and bending shaped bicycles/hearts/eye spectacles, I was asked to join them for lunch. The kids gathered into a long room and sat on the floor in an elongated oval shape as food was brought in by a few of the boys. 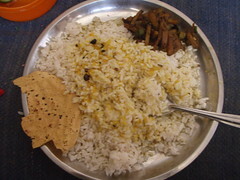 A plate of rice and dal, with aloo gobi, and poppodums, was placed in front of me. It smelled so good. The boys began eating, mixing their food together with their tiny right hands, giggling at me and my fork. Throughout lunch, the kids continued to open up to me with their outgoing, yet curious, personalities. While it was only the first day, I have started remembering their names based on their humorous personas… I’m horrible with names and I have 10 of them to learn. We attempted to play a game of dust bowl soccer, but it naturally turned into a game of keep away when my tiny teammates found it funnier to try to take the ball away from me. I held my own for a good couple of minutes, as my former skills resurfaced long enough to show off some intense foot maneuvers, but I was quickly reminded how much energy kids have; my endurance eventually failed, I was no match for their little legs. 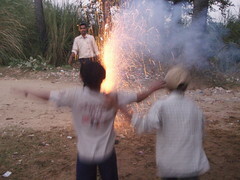 The Fire Crackers were brought back from town by Tinku and Nikesh. Tonight signified the start of the Diwali festivities. I definitely could not resist in partaking in the festivities, as we all began setting off bottle rockets, sparklers, m-80s, and what ever loud explosive that was pulled out of the bag. 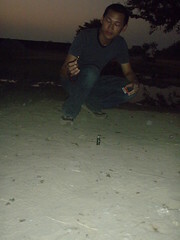 It was like being a kid again, without having to worry about getting busted by the cops. 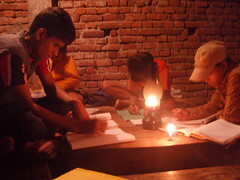 Later in the evening, the kids started working on their math homework. Holy crap, are these kids smart; most of them were doing multiplication, division, and square roots. Arvind, the 14year old, was working on his algebra and geometry, in addition to his physics and biology… That kid is sharp as a tack. Nikesh joined me in dinner tonight. His friend Amit, drove us to his friend’s new restaurant, via his sleek Hero Honda Motorcycle. It was really good to be able to just talk and hang out with Nikesh. He’s such a good guy and I am so very honored to call him my friend.